Sting and Shaggy brought positive vibes to close out the 2018 concert season at the Santa Barbara Bowl. The show was rescheduled after Sting had to cancel because of a throat illness. The doctors ordered him to cancel several shows, and luckily for Santa Barbara they were able to secure Monday's closing date. The warm evening created a perfect setting for the crowd to boogie down to the upbeat stylings of Sting and Shaggy and their 44/876 Tour. The show opened with Sting’s “Englishman in New York,” and immediately the audience was pumped up. Sting looked fit wearing a black 44/876 Tour T-shirt and tight black jeans. The night was filled with reggae vibes that Shaggy brings from his Jamaican heritage, and next up it was Shaggy’s turn singing “44/876,” which is the title track to Sting and Shaggy’s collaborative 2018 effort that was released on A&M/Interscope Records in April and is holding the 40th spot on the U.S. Billboard Top 200. The title is a reference to the area codes of the United Kingdom (44) and Jamaica (876). It was the night’s first taste of Shaggy’s stage prowess and gifted lyrical talent. The show would reveal a well-paced trend of a Sting song followed by a Shaggy song. He joyfully dodged and burned vocal harmonies back and forth with Shaggy and their backup singers, Melissa Musique and Gene Noble. Sting provided the backbone bass riffs, and Shaggy was vibrant as he raised the energy of the crowd, repeatedly hyping them up shouting “Santa Barbara” with his native Jamaican accent. My personal favorite mash-up of the night was "Walking on the Moon,” which effortlessly flowed into Bob Marley’s “Get Up, Stand Up.” Knowing that the legendary reggae superstar Marley had performed on that stage made it that much more special. It is always a gift when the songs of Marley can fill the air at the Santa Barbara Bowl. It was clear that Sting and Shaggy have a chemistry that bonds them. With ska, reggae, rock and rap, the packed house could feel the energy between the performers, and they fed on it all night long. 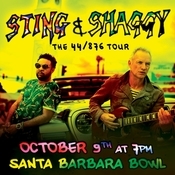 Sting and Shaggy along with the high acumen of the talented musicians in their band served as catalysts to fulfill the end of another great concert season at the Santa Barbara Bowl. The 2018 staff and volunteers of the Bowl and Goldenvoice need to be credited for working so hard to provide a venue to bring people together to experience so many magical nights. This concert season started with charity shows by Jack Johnson, Katy Perry and Brad Paisley to help benefit victims of the Thomas Fire and Montecito debris flows. The concert season ended with Sting reminding us all of how fragile life is.